The reason we came to Linfen was to let Jeanette's grand-daughter Sophie know her grandparents. Now we have spent eight months together: from left, Tania Jain, Sophie at 18 months, myself and Jeanette, posing among the new growth of Spring at Shanxi Normal University. Tomorrow they leave for Hangzhou, and I remain here to work until the end of semester in June. 'To write and eat at the same table' is harder than it sounds. I have never found Prynne clearer. Poem in memoriam Peter W.
Thank you to Suzie and Hazem for this wonderful gift. The calligraphy reads Dragon in various ways, and I fell in love with it when I saw it in Beijing. Now it will hang in Western Australia, part of my Dragon Dreaming. Howard Nemerov - "I would talk in iambic pentameter if it were easier." The Haiku poets of the Japanese tradition always counted their calligraphy as part of their art, and in China to this day, calligraphy is a highly praised art in itself. In fact, calligraphy is one among the many disciplines young Chinese art students learn. And handwriting here is of a standard that would shame 99% of Australian students. My tools for writing are a Benq laptop and Windows XP. I can't sit down to sharpen twelve of them before I start, or dip my nib in the inkwell to refresh my mind ... Sometimes I walk out and scribble a note in a notebook (my sister has never followed behind me and taken notes ) but it is a rare thing, and most times the jotted words are edited out early in the piece. I do often sleep with pad and pen beside me, but it has only worked once to give birth to a new poem, a nightmare at that. Occasional class notes have appeared, however, through this method - and teaching does pay the bills. I enjoy the act of writing, as Lyn H says ... but must sleep now or tomorrow the words will all be sleeping in little divans at the base of my cerebral cortex. The 4th Kokako Haiku and Senryu Competition is now International! 1.Haiku must be previously unpublished and not under consideration elsewhere. 2.Entry fee is NZ$5 for every 3 haiku; for overseas entries, US$1 per haiku. 3.Send two copies of each haiku, or group of haiku, with your name and address on one copy only. 4.Winning haiku and commended entries will be published in Kokako 8 (April, 2008). 5.Winners will be notified by mail. "I now propose a new tag: Things which one has read and has been influenced by which are not confined to those paper-bound vessels of the printed word we refer to as books. Let's call these Non-Books. Or maybe Impossible Books. Or Limen Books? It's up to you." My blog list has disappeared into the ether, so I can only issue the broadest of tags - to all you bloggers, particularly the poets, who would care to participate. As they renovate, nobody works harder than the donkeys carting the materials. The Board of writingWA is pleased to extend congratulations to Alice Nelson, winner of the 2006 TAG Hungerford Award for her work of fiction entitled In Arcadia. The Award was announced by Alastair Bryant, Director General of the Department of Culture and the Arts, on Sunday 25 February, at a presentation dinner held at Lamont’s East Perth restaurant. The TAG Hungerford Award carries a cash prize of $6000 provided by New Edition Bookshop, and a publishing contract with Fremantle Arts Centre Press. 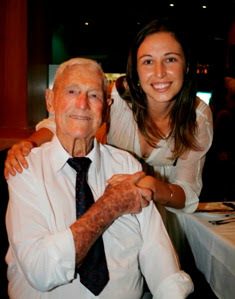 An extract from In Arcadia will be published in The West Australian on Saturday 10 March. 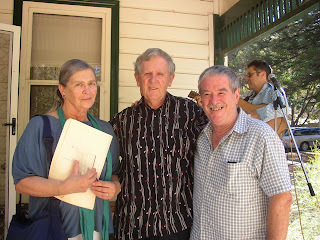 Also shortlisted for the 2006 TAG Hungerford Award were Deb Fitzpatrick and Varnya Bromilow who each received additional cash prizes of $500 contributed by Tom Hungerford in a gesture of appreciation for the quality of their writing. The 2006 TAG Hungerford Award is sponsored by New Edition Bookshop, Fremantle Arts Centre Press, The West Australian Newspaper, and writingWA. The judge was Fay Zwicky, Highly Commended went to Glen Phillips, and the First Prize went to Murray Jennings. They are pictured on the front verandah of Tom Collins House Writers Centre, by the sea in Swanbourne, Western Australia, just yesterday, 4 March 2007. It was a very special day for Murray all around because it was his wife Ros's birthday, and their 40th Wedding Anniversary - and he won the prestigious Tom Collins Poetry Prize. Congratulations, Murray and Glen - and Fay, if it comes to that. The prize is offered by the Fellowship of Australian Writers, WA branch, annually, and is sponsored by the Furphy family in Shepparton, Victoria. The original 'Tom Collins' was the narrator of 'Such Is Life' by Joseph Furthy who built the house in its former location of Servetus Street, before the government put a (necessary) highway through. The house was moved up the hill and around the corner to a picturesque spot among the trees near Alan Park. People walk under lanterns hung to celebrate the Lantern Festival in Tianjin municipality. 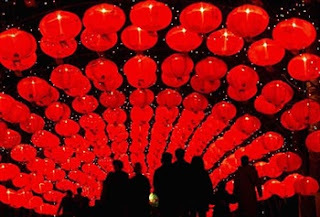 The Lantern Festival falls on March 4 this year, the 15th day of the first month of the Chinese lunar calendar. Anchorite Press is pleased to announce the release of a new collection of poems, MEDITATIONS ON THE STATIONS OF MANSOUR AL-HALLAJ, by Pierre Joris. Each handmade chapbook is 5.25 x 8.625 and features a Rives deckled cover and cotton wove endpaper. 21 special editions, signed and numbered by the author, are also available. Each stitched special edition features handmade endpaper. To peruse our archive of previous publications, or for ordering info, please visit our site: www.anchoritepress.blogspot.com. You can also contact us via email directly: anchorite.press@gmail.com. Peter Craven in The Australian newspaper had a lot to say about Oz poetry. It is good to see it getting some attention - and positive attention at that. Maxianne Berger, Roger Day, Andrew Burke, Sally Van Doren, James Davies, Simon Perchik,Mary Rising Higgins, Rodney Nelson, Elizabeth Kate Switaj, Jason Wilkinson,Michael Young, R. L. Swihart, Maurice Oliver, and Chanming Yuan.